This is about as good as my cake decorating skills get. 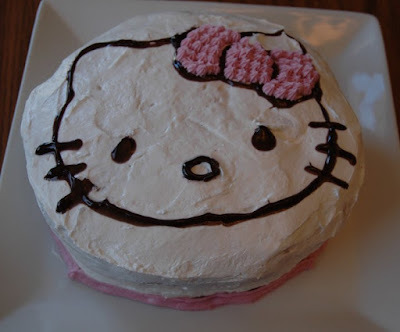 My little girl's 6th birthday was last week and she wanted a Hello Kitty cake. I am NOT a perfectionist as you can tell from the cake, but I'm happy because it made my daughter happy. Maybe next time I'll use fondant so I don't have to smooth out the frosting. I'm pretty sure most of the cake was held together with frosting. Now it's your turn to share. If you've planned your menu for the week post it in the comment section. Thanks and have a great week! Check back in a few days for a yummy chocolate recipe.